Speaking at Computer Science department of SRM University, via Skype. Photo courtesy, of SRM University, (2015). Meeting with Mr. SKP Karuna, Tamil writer, and chairman of SKP group of institutions, before my speaking engagement at SKP College in Thiruvannamalai. Photo couresty, SKP Engineering College, (2015). were well received at SKP (Thiruvannamalai), and SRM (Kattankulathur). I’m always indebted to the wonderful reception of the hosts and Tamil hospitality they extended to me. At SRM, Dr. Ila. 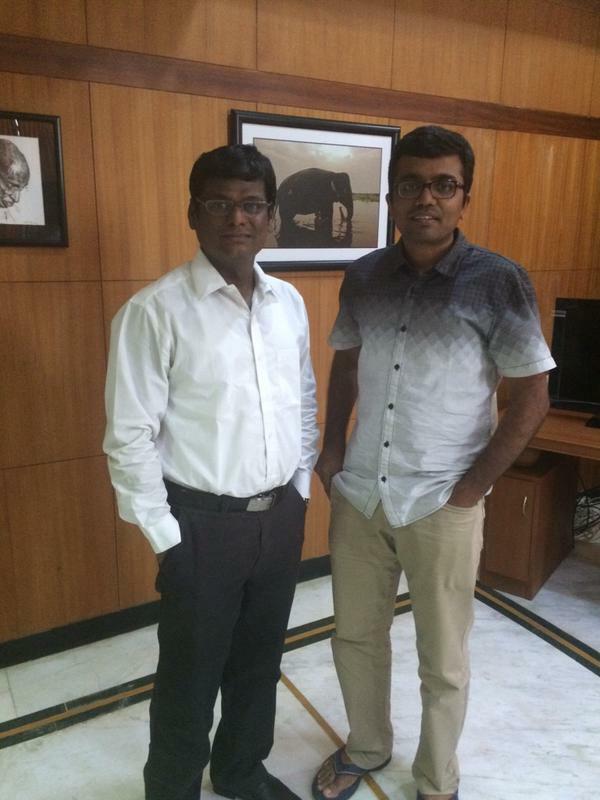 Sundaram received me and signed a gift copy of his recent book, “தமிழ் கணிமை“. We spoke about documenting the history of Tamil computing; Dr. Sundaram emphasized need for developers and language experts to work hand-in-hand. Later, I spoke with Computer Science professor Dr. Poovammal, and other faculty who were very enthusiastic about adopting computational linguistics as project topics for their final year (senior) students. The virtual-hosts (no pun intended 🙂 ) Mr. Nagarajan, and Mr. Ravishankar, organized the travel and speaking engagement at SKP college in Thiruvannamalai; it was an eventful trip as I met Mr. SKP Karuna, and various faculty at his institution. Mr. Karuna gifted me a signed copy of his book, “கவர்னரின் ஹெலிகாப்டர்“, among other niceties of the invitation; we spoke briefly about my meeting with writer Appadurai Muttulingam, who has also written the foreword for his book. On the long ride from Thiruvannamalai, I found his story, “கலர் மானிட்டர் (color monitor),” to be entertaining and funny; area of a triangle with a perimeter s needed some typographical fixes & -> ‘-‘. I enjoyed a few other short stories in the collection. I spoke about github, 2 years of open-source development, and our collaborators – Arulalan, Shrinivasan, Sathia, and others. Tamil language and Tamil computing have a long history, and lot of unsolved hard computer-science problems; you have a good chance of putting your mark on these problems, and having a great impact. 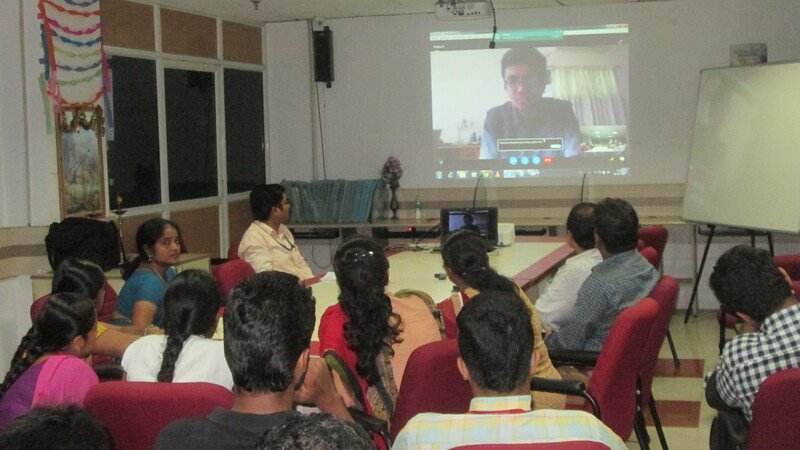 Due to time constraints I was only able to make a Skype interview with SRM Computer Science engineering folks, whereas I traveled to SKP College for my presentations. At SRM I was impressed by some thoughtful questions and answers on Tamil software adoption/usage. At SKP the speaking engagements was in 2-parts; the focus group engagement with Center-of-Excellence students was admirable for their knowledge and skill in developing Android applications in various education/geo-location based applications. Definitely reach out to the staff/faculty/administration of the various engineering institutions in Tamilnadu; you are fulfilling a social responsibility role. Reach out to various administrators on Twitter/Facebook or via email etc. I recommend you to freely mix your language between Tamil/English to convey the message; written/spoken forms of Tamil have that dichotomy, and besides your audience will follow both forms easily. I’m very hopeful that young students, men and women, who are future India, future Tamil speaking developers and users will participate in a software market in buying/creating and using native Tamil software primarily developed for Tamil, not just localized for it. Unfortunately on the return flight, I misplaced my phone and lost it; unless I receive the device from lost-and-found I maynot be able to share some useful audio content from both presentations. Please hope I do get the phone. More later.